The Vatican’s original plan for the Sistine Chapel was for Michelangelo to create 12 grand portraits of the Apostles. Instead, the artist painted the famous ceiling with a complex design of more than 300 figures – none of whom is Christian. Why? Come hear Rabbi Benjamin Blech tell the astonishing story – of a brilliant artist, an underground of freethinkers and a private group of Kabbalists. At the West Bloomfield Jewish Community Center (6600 W. Maple Road, West Bloomfield. Dessert reception following! The Vatican library is home to more than 800 ancient and valuable Jewish manuscripts. How did these come to be part of the Vatican collection, who uses them and what is their fate? A Kosher buffet Lunch will be served. $30 for both programs, $12 for the August 28 lecture, $25 for the August 29 lunch and learn! Go to http://bit.ly/A-OK2013 to register! See article below about AOK! St. Paul’s Lutheran and Peace Coalition in Alpena, Michigan at the Alpena County Library Conference Room. Contact Gail Katz for more information, gailkatz@comcast.net and to register!! will be on the bottom of the page! Guest speaker is producer Audrey Geyer. at the Bharatiya (Hindu) Temple in Troy. As the President and Co-Founder of WISDOM (Women’s Interfaith Solutions for Dialogue and Outreach in MetroDetroit) and the Education Co-Chair of the InterFaith Leadership Council, I would like to reflect on this most incredible weekend that we called Acts of Kindness (A-OK) Detroit that is held on the Sunday closest to 9/11 in September. Acts of Kindness, a national community service weekend initiative that has been taking place in cities around the country, has been held here locally in Southwest Detroit and Dearborn. This initiative pulled organizations from across Metro Detroit to engage volunteers in a variety of community service events, helped us to remember what happened on 9/11/2001 and, in so remembering, gave us the vision to work toward the renewal of our own needy community. The Acts of Kindness mission is to transform 9/11 from a day of mourning into a day for people to come together to work side by side to make their community a better place to live, a day to learn about each other’s interests, families, faith traditions, and a day in which we can find our commonality as human beings in order to reduce myths and stereotypes about the “other,” and increase respect and understanding. I heard about this Acts of Kindness initiative from my interfaith sisters in Syracuse, New York. Women Transcending Boundaries (www.WTB.org), and I decided to spread the word about their plans for A-OK, and their enthusiasm lit a fire in my soul. I announced this idea to the Education Committee of the InterFaith Leadership Council of Metropolitan Detroit, and it wasn’t long before we were connected with WISDOM, the Arab Community Center for Economic and Social Services (ACCESS), City Year, the Michigan Muslim Community Council, University of Michigan-Dearborn, FOCUS: Hope, Henry Ford Community College, Welcoming Michigan, First Congregational Church of Royal Oak, and J-Serve, as our main partners. What was accomplished by working with such a dedicated committee – a very diverse committee made up of young and not so young – Muslims, Christians and Jews – men and women, retirees and employees – Black folks and White folks – was all of us plowing ahead to make A-OK Detroit a meaningful happening. In the past we have deployed folks to sites in Detroit to mulch and weed, plant flowers, trim bushes, board up decaying buildings, pick up garbage, paint over graffiti, clean up playgrounds for children, and partner with Kids Against Hunger (who would distribute our packaged food to the hungry in Detroit as well as in Africa) and Care-A-Van, who would distribute our packages of non-perishable food in paper bags (which were decorated) to the homeless in Detroit! We have made a difference in Detroit, but we must continue to bring our diverse population together to help our city!! We must maintain our relationships and move forward to break down our cultural and religious segregation. Diana Eck, Director of the Pluralism Project at Harvard University has stated “Diversity is a fact. Pluralism is an accomplishment! !” The A-OK committee is working to do just that – transform our diversity into pluralism by getting different people together to talk, break bread together, do community service together, and find out what we all have in common, to INTERACT!! Here’s to a great weekend, to a great A-OK Committee, to great volunteers, and to a continuation of Acts of Kindness in cities all over our great country, and here in Detroit in the years to come!! to register for the community service projects! To register, please visit the IFLC website www.detroitinterfaithcouncil.com and click on the “Event Registration” button on the right side-bar. The $8.00 registration fee can be sent electronically via PayPal through the link at the bottom of the registration form or you can mail a check to: The Interfaith Leadership Council, 10821 Capital St., Oak Park, MI 48237. Questions? Contact the Rev. Bob Hart at 248-546-1255. You can also pay at the door!! Light refreshments will be served! This discussion is the second part of a series about life cycle events across faith traditions. On Sunday, June 23, a gathering of people from different cultural and religious backgrounds locked arms in the spirit of social justice and sang, “We Shall Overcome,” recalling the historic march 50 years ago led by Dr. Martin Luther King, Jr., and the first rendition of his historic “I Have A Dream” speech at Cobo Hall in Detroit. Rev. Kenneth J. Flowers, a longtime proponent of interfaith relations, hosted “An Interfaith Gospel Celebration” at his church, Greater New Mt. Moriah Missionary Baptist Church, in Detroit. About 200 people — some of whom participated in the original march — attended the event, which included remarks from Robert Bruttell, IFLC chairman; Rabbi Daniel Syme, Temple Beth El; Imam Mika’il Stewart Saadig, representing the Michigan Muslim Community Council; and Donnell White, executive director of the Detroit Branch NAACP. The Mt. Moriah Youth & Young Adult Choir and Imani Choir provided inspirational gospel music to close the program. Pastor Flowers was passionate about his life long relationship with Rabbi Syme and many many others in the Jewish community. Likewise Rabbi Syme spoke of the pride he and his father had when a Jewish man, Kivie Kaplan was elected president of the NAACP in 1966. IFLC chair Bruttell remarked that it was coalitions of faith that have pursued Dr. King’s dream and now it is time to reinvigorate those interfaith coalitions because there is serious civil rights work yet to do. People of faith cannot sit back while 25% of young black men are routed into prisons and white families have 20 times more wealth that black families. Imam Saadig and NAACP executive director White pledged to join this coalition both in their remarks and through the interlocking of hands as all present sang and swayed to We Shall Overcome. On the morning of June 21st I participated in one of the classes held at the Chaplaincy Institute in Berkeley, California, where I am on the Advisory Board of Directors. I got connected with this interfaith organization through my wonderful friendship with Deb Hansen, who was ordained an interfaith chaplain at this institute a few years ago. The Chaplaincy Institute (ChI) consists of an experiential curriculum combining the study of world religions, and exploration of mystical paths and teachings, and spiritual care and skills for ministry. All of this is done in a creatively infused context which emphasizes an interfaith practice of respect and inclusivity toward all spiritual expressions. The ChI Interfaith Community ordains ministers who have heard a call from the Divine to serve and believe in an underlying connection between all existing religions and spiritual expression as complementary paths. The ChI program is designed for those called to practice one-to-one spiritual direction, as well as for helping professionals who include spiritual guidance in their work as therapists, health providers, and ministers. 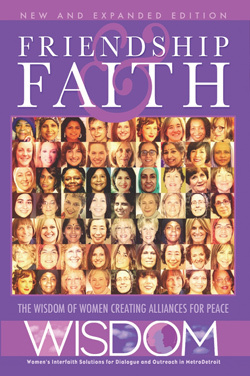 Upon completion, individuals are certified Interfaith Spiritual Directors. Vanessa Gomez-Brake, the Director of Outreach and Operations at ChI, presented a class on Interfaith History and Appreciative Inquiry the morning that I attended the Institute. I had the opportunity for an hour of her class to present Metro Detroit as an interfaith community and a great model to other communities, emphasizing WISDOM, the Interfaith Leadership Council, the World Sabbath, Face to Faith, and Acts of Kindness (AOK) Detroit. It was fun to interact with the 20 students in the class (ages 30’s to 70’s). Saturday evening I was invited to join the students for an interfaith service at the Foundation of the Sacred Stream, “a non-profit organization dedicated to bringing the wisdom of ancient spiritual and healing traditions into the consciousness of those interested in being of service in the world.” We all participated in the listening to spiritual drumming, the sharing of healing thoughts and rituals, and participatory prayers. I had the honor of sharing a “Prayer for the World” by Rabbi Harold Kushner, and everyone read the prayer with me. We had the opportunity to light a candle in the room, adding to the spiritual glow around us. At one point we all lay in a circle on the floor and touching hands with the person on either side of us, and broke the silence with the words about what we would like to see to make our world a better and more connected place. This was a very beautiful and moving experience! I am very honored to be have been asked to be on ChI’s advisory board, and I hope to have more opportunities in the future to interact with the ChI staff and students! I greatly enjoyed my time with them. For more information go to the Chaplaincy Institute’s website, www.chaplaincyinstitute.org or call 510-843-1422 and ask for Lauren Van Hamm, Dean of Interfaith Studies. Regarding Prayer on the football field!! As a result of the recent news reports regarding prayer on the football field, there seems to be a fundamental misunderstanding of what is and is not allowed in our public schools. Public schools are, by definition, schools that are maintained at public expense for the education of the children of a community. The students who attend our district are incredibly diverse, representing over 60 languages spoken and a wide range of ethnic, cultural, and religious backgrounds. We celebrate these differences with culture fairs, extensive world language programs, and a plethora of other activities which allow our students to develop a rich community of understanding and friendship. Our administrators, teachers, and support staff understand the delicate balance of respecting a student’s faith and freedoms, while maintaining a neutral learning environment, ensuring that each student is provided with an emotionally safe space for instruction. Our students should feel comfortable in their environment and we respect their freedom to pray or not pray. However, Bloomfield Hills Schools is a public school district and therefore, prayer must be conducted so as not to conflict with instruction time, other students, or school sponsored activities. If students desire to pray, it cannot be incorporated into classroom instruction, official team meetings, etc. Enforcing this Board Regulation is our way of maintaining a supportive environment for all students. We appreciate your understanding and cooperation, but more importantly, we appreciate your openness in sharing your unique backgrounds with us. Our differences unite us in Bloomfield Hills Schools and our students are well-rounded, caring, and respectful individuals as a result. Please watch the Channel 4 news report at the bottom of the following website, if you are interested!! Students and young professionals from around the world have gathered in Sarajevo, Bosnia to exchange experiences and fight prejudice and hatred. They represent different cultures and races and speak dozens of languages, but they share either one of two identities: they are all Muslims or Jews. As religious tensions flare and Islamophobia and anti-Semitism plague societies, these courageous young people are determined to forge a future of greater peace and understanding. The conference is the fourth organized by The Muslim Jewish Conference (MJC), a Vienna-based organization whose goal for the conference, according to their website, “is to provide the next generation with a learning experience for life and a positive outlook for establishing intercultural relations and sustaining Muslim-Jewish partnerships.” In three years, the MJC has attracted more than three hundred young leaders from fifty countries to lead and participate in conferences in Vienna, Kiev, Ukraine, Bratislava, Slovakia, and now Sarajevo. Jay Schultz, an American currently living in Israel, and Shanza Ali, who is from London, spoke to The Huffington Post from the conference. Both explained how they have taken advantage of this unique opportunity for an open and honest dialogue with the “other” that seems impossible at home. “I came to the conference from Israel where I don’t get to interact with Muslims outside the Israel Arab debate,” Jay explained. “But for me, the theology is so interesting, what it means to both be the descendants of Abraham and work together to create ‘chesed’ or kindness in the world. Being able to discuss how to work hand-in-hand is not something I get to do with Muslims in Israel because of the conflict.” For Shanza, the university life in the United Kingdom is where she finds the divide between Muslims and Jews. “The conference gives me the opportunity to interact with Jews from so many backgrounds, but most of all I have made some incredible friends. I am in the gender and religion project at the conference and we are working together to find solutions to mutual problems we face on that topic. The conference has proven intellectually and spiritually beneficial.” Ilja Sichrovsky, founder and Secretary General of MJC, started the conference in 2009 with 15 volunteers from six countries. It has expanded to include 30 volunteers from 16 countries. Sichrovsky explained that each year they look for outstanding applications from Muslims and Jews who have an important perspective to share, but who are also interested in listening to the perspectives of others. The conference also acknowledges that it is not only important to have a good balance between Jews and Muslims, but also a balance between the more secular and more religious participants. One of the surprise benefits of the conference has been the intrafaith conversations that take place alongside the interfaith ones, as well as the intrafaith conversations that happen when participants return home to their family and friends in 39 countries. When asked about the organizers measure of success, he was quick to mention the six committees that the participants work on, including conflict transformation, anti-Semitism and Islamophobia through cinema, hate speech and its influence on public opinion, introduction to Judaism and Islam, gender and religion, and education and the effects of historical narratives. But when it comes down to it, success is something much more basic. Parwin Anwar’s suburban Detroit home was bustling. She had offered to show me how to cook some of the dishes her family eats during Ramadan, which starts at sunset on July 8 this year. Her two daughters-in-law had come to enjoy the fruits of her labor, bringing with them two friends and three toddlers. The room hummed with activity and love. In addition to learning how to make some Afghani foods, I wanted to get a sense of how Muslims cope with the month-long fast, especially when Ramadan falls in the summer when the days are so long. Because the Islamic calendar is a lunar one, with no correction to bring it in sync with the solar calendar, Ramadan occurs approximately 11 days earlier every year. Going without food and drink between dawn and dark would be hard enough in the winter, when there are about 10 hours of daylight. How much more difficult it must be in the summer months, when-in Michigan anyway-the fast stretches on for more than 15 hours. And, when it often is hot enough to easily dehydrate anyone, let alone a fasting person. In Muslim countries, schools, stores and offices close or modify their hours so that people can eat and do their business after dark and sleep during some of the daylight hours. In countries where Muslims are a minority, Ramadan is a challenge. Parwin Anwar with a platter of bolani. Parwin says many women start shopping and cooking weeks in advance for Ramadan and for Eid al Fitr, the festival that marks its end. She often makes curries, soups and other dishes and freezes them for use during Ramadan. Then all she needs to do to make a meal after the fast is defrost something, cook up some rice or noodles and throw together a salad. Parwin fries the stuffed bolani. The Anwars’ Ramadan meals usually start with a soup. They often eat pakora-thin slices of potato dipped in a chickpea-flour batter and deep fried-and bolani, a pan-fried turnover filled with chopped scallions, pumpkin or potatoes. The meal often ends with fresh fruit. Getting a recipe from Parwin posed a problem. Like many traditional cooks, she does not measure her ingredients using standardized cups or weights. She knows from memory how much of what should go into each dish and she cooks by sight, feel and taste. This week’s Feed the Spirit recipe for bolani-the Afghani stuffed fried bread that they enjoy in their home-was adapted from what I saw Parwin do in her kitchen and recipe resources I found online. The best online recipe I found comes from an Afghani family in Australia. The web page includes a good video showing how to make bolani and links to other Afghani recipes. Mona Bora, left, and Savita Jain, both of Farmington Hills, link hands in a dance at a Jainism convention in Novi. Jainism began in India over 2,800 years ago. About 1,000 of the world’s 5 million Jains live in metro Detroit. More than 3,700 Jains were in metro Detroit in July for a national convention that seeked to apply the peaceful principles of their ancient religion to the modern world. “It’s a great place for people to connect and collaborate on the Jain way of living,” said Prem Jain, 62, of San Jose, Calif., one of the conference organizers. The convention, mostly held at the Suburban Collection Showplace in Novi, is drawing Jains from across the U.S., Canada, England, and India. Started in India more than 2,800 years ago, Jainism has about 5 million followers worldwide, roughly 150,000 of them in North America. About 1,000 live in metro Detroit, and a Jain temple is located in Farmington Hills. Though small in numbers compared to other religions, Jainism’s ideas have influenced leaders like Gandhi, who was inspired by the Jain idea of nonviolence, known as ahimsa. The idea is not just about nonviolence physically, but about not being aggressive in one’s thoughts and emotions toward other people, Jains say. The convention drew Jains from near and far, like Rajesh A. Shah and his wife, Nisha R. Shah. They live in Orlando. Being nonviolent to animals is also part of Jainism. At the convention, several booths were dedicated to vegetarianism and the welfare of animals. “All lives have equal rights,” said Ketan Sheth, 54, of Tulsa, Oklahoma, in front of a display of photos of animals in shelters. Jains are strict vegetarians and often fast as a way to improve spiritually. Some even try to avoid killing small insects. At the convention, some monks had pieces of cloth around their mouths because they believe that even accidentally inhaling insects or microscopic airborne creatures is wrong. At the Jain temple in Farmington Hills, they hold special prayers every Thanksgiving Day for all the turkeys killed. Two of the other basic ideas behind Jainism are to not be overly attached to material goods and the doctrine of Anekantavada, which teaches that truth is the result of multiple viewpoints and not just one. The truth is found by considering the views of everyone, including one’s opponents, according to Jainism. Prem Jain, who is the head of a computer network company, said he tries to apply that idea when dealing with fellow workers. The convention continued with lectures about interfaith relations and applying Jainism to the business world, along with a concert that featured the Michigan Philharmonic orchestra. The title of this blog post may surprise many people. Is it possible that Islam is being reformed? And in Israel! The answer is yes, as I discovered when I attended a fascinating research seminar last week at Tel Aviv University on “Contemporary Islamic Thought in Israel”. The seminar, which took place at Tel Aviv University, brought together Jewish and Arab scholars and practitioners (like me) as well as Jewish and Muslim clergy and educators. It was a groundbreaking program, which reinforced my own experience of many years that has taught me that there is a fascinating phenomenon in Israel which I call “Israeli Islam”. The main speaker at the conference was my friend, Kadi Iyad Zahalka, a kadi (religious judge) of the Muslim Sharia court of the state of Israel, which functions under Israel’s Ministry of Justice. I have known and admired Kadi Zahalka for the past several years. We traveled together on a speaking tour to the USA last fall, and will go again this coming fall. And, a few months ago we began a new Jewish-Muslim Dialogue and Action group comprised of local religious leaders, educators, academics, community leaders, and journalists, which we call Kodesh — Kolot Dati’im L’Shalom– Religious Voices for Peace. We will study together, discuss issues of mutual concern, and take action together in our communities.I wanted to hear Kadi Zahalka speak about the research he has been doing for his doctorate in Islamic Thought at the Hebrew University of Jerusalem. His topic is how Islamic jurisprudence can be applied to Muslims who live in non-Muslim countries — such as Europe countries or the United States — and especially in Israel. This is a topic that is close to his mind and heart and he is very passionate about it. Kadi Zahalka calls his interpretation of Islamic Law “reform” or “liberal”, which in itself is quite amazing. But he is not a “Reform Muslim”. Rather, he, and other kadis in Israel, have been changing and updating Islamic Law in recent decades, entirely from within their own tradition. If we take the Jewish community as an example — Zahalka is more of a modern Orthodox Islamic Liberal than a Reform Rabbi! His work, which is based on solid scholarship over many years, brings classical Islamic doctrines up-to-date for the times in which we live. He, and the other kadis in Israel who represent a new generation of serious, responsible, and thoughtful religious leadership, are slowly but surely changing the face of Islam in Israel today. This phenomenon is virtually unknown both inside and outside of Israel. The mainstream media does not report on this and tends to portray all of Islam as radical and fundamentalist and would be surprised to learn that the leadership of Israeli Islam is rational, moderate and even liberal in their thinking. This is why I take the time to write about this. Unfortunately Islamophobia — based largely on ignorance and misinformation — is rampant, both in Israel and beyond. This is why it is so refreshing to hear Muslim moderates, like Kadi Zahalka, speak so thoughtfully and inspirationally about new reform thinking in Islam — in Israel and in other parts of the world — today. Despite the widespread presence of radical Islam in many countries surrounding Israel in the Middle East, Islam in Israel remains, for the most part, both solid and sane. This is indeed a very positive development. This is not to say that there are no problems here. As Kadi Zahalka pointed out quite accurately in the discussion in Tel Aviv, Israeli Muslim Palestinian Arabs not only face much discrimination in Israel, but they are also part and parcel of the conflict in the region. Despite this, they do their best to get on in life, to develop their own way of life and to adapt it to contemporary contextual realities. I applaud Kadi Zahalka for his thoughtfulness, clarity and courage to present new ideas which may go against mainstream thinking about what Israeli Muslim citizens think and how they live. For example, women get complete equal treatment in his sharia court, according to his understandings of Islamic legal tradition and in light of contemporary circumstances. And, I am glad that I will have another opportunity to travel with him next fall to spread our message of peaceful coexistence and cooperation to audiences throughout North America. I feel fortunate to partner with such a creative and charismatic leader who genuinely believes in the value of dialogue and seeks to act together to effect social change in Jewish and Palestinian communities in Israel and in Israeli society as a whole. The Louis and Fay Woll Memorial Bible Garden, located at 5075 West Maple Road, West Bloomfield, on the campus of Congregation Beth Ahm, is currently in full bloom, and people of all faiths are welcome to visit for learning and reflection. The Garden is open in the summer, fall and spring, from sunrise to sunset. The Louis and Fay Woll Memorial Bible Garden was created by Dr. Douglas and Margo Woll in 2010 to honor the memory of Doug’s parents, who believed in and exemplified the principles of goodness, caring and generosity. The Bible Garden was designed by Gary Roberts of Great Oaks Landscaping and features ceramic artwork by Carol Roberts of Tuscon, AZ. The Woll Bible Garden is available for group tours as well as for informal individual visitation. Group tours can be arranged to take place any day of the week with the exception of Shabbat (Saturday). If your group would like to tour the garden with a synagogue docent and also have the opportunity to visit the Beth Ahm sanctuary and learn more about Judaism, please contact Rabbi Steven Rubenstein by phone (248) 851-6880 ext. 17 or by e-mailravsteven@cbahm.org to schedule your visit. There is no charge to visit the Woll Memorial Bible Garden individually or for official group tours, but donations are welcome to help support the continued maintenance and enhancement of the Bible Garden as time goes by. All are welcome to find enjoyment, beauty and peaceful reflection in the experience of exploring the Louis and Fay Memorial Bible Garden in person or online. For more information, visit http://www.wollbiblegarden.org/ or http://www.cbahm.org/woll-bible-garden or contact Rabbi Steven Rubenstein at 248-851-6880. Makhmalbaf was banned from Iran eight years ago, when his more than 30 books and films that address Western ideologies of democracy and freedom from religion and authoritarian dictatorship were marked as propaganda and banned by the Iranian government. Since fleeing Iran, Makhmalbaf and his filmmaking family have shuffled around Afghanistan, Tajikistan and Paris, but he said he was driven out of each place because of terrorist plots again him. One such attack took place in Afghanistan, he said, when he was shooting the award-winning 2001 film “Kandahar,” about an Afghani woman from Canada who travels through pre-9/11 Afghanistan, during the rule of the Taliban, to find her sister. According to Makhmalbaf, the Supreme Leader of Iran Ali Khamenei sent terrorists to drop a grenade during the middle of shooting a scene. One person died and numerous others were injured. “That’s when the Iranian government started printing articles against me and my work. They put out a notice saying they would go to any lengths to kill me,” he said. Makhmalbaf has been a strong supporter of Israel, saying he wishes Iranians and Israelis could visit each other’s countries. One of the things he found most fascinating about the country, he said, is the way many of its citizens strive to create a way to live peacefully together. “I found out there is a solution between people. Even if the government can’t fix it, they can talk to each other,” he said. The film festival featured a series of Makhmalbaf’s films during the 10-day event, in a “Tribute to Makhmalbaf,” showcasing four of his past works and a special July 10 screening of “The Gardener,” after which the filmmaker received a Lifetime Achievement Award for Peace and Freedom.